Falvey Memorial Library :: VITAL Resources for New & Continuing Faculty! VITAL Resources for New & Continuing Faculty! The Villanova Institute for Teaching and Learning (VITAL) sponsored a new-faculty orientation program on August 18 and 19 in several locations across campus. 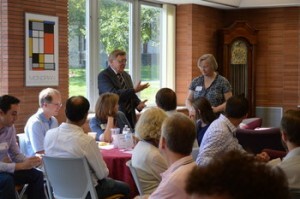 As part of this program, new faculty were welcomed to Falvey Memorial Library on Tuesday, August 19, for a breakfast meet and greet. Interim Director Robert DeVos, PhD, welcomed librarians, and Jutta Seibert, team leader for Academic Integration as well as the coordinator of the liaison team to the departments of history, sociology and criminal justice, eagerly introduced librarians and staff to new faculty. 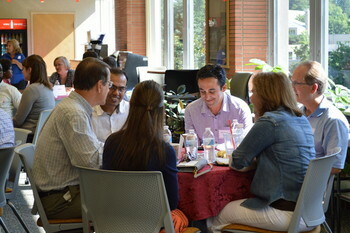 New faculty members also had the opportunity to gather according to disciplines for informal discussions with liaison librarians in their subject areas. The event provided new faculty a strong sense of what services the Library has to offer the Villanova Community! 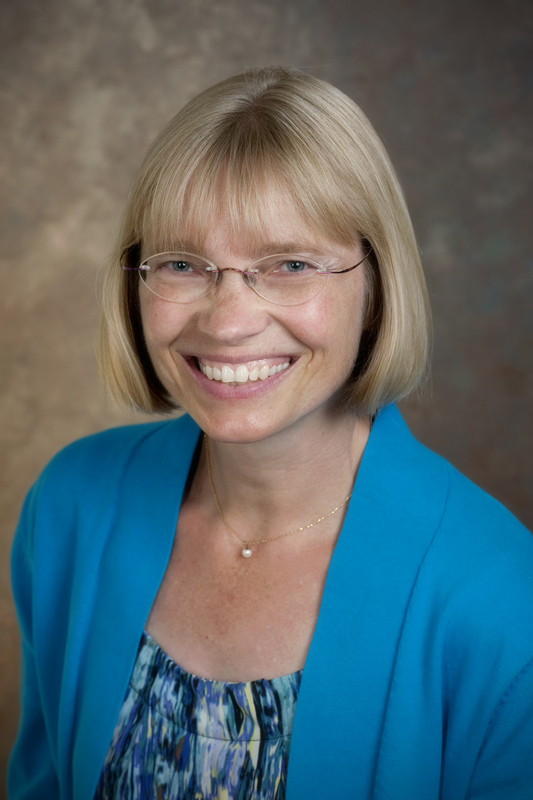 Following the event, I (Gina Duffy) interviewed Gabriele Bauer, PhD, director of the Villanova Institute for Teaching and Learning (VITAL), to discover more about the new faculty orientation program as well as VITAL’s activities and general campus mission. RD: How many new faculty members did you welcome to Villanova this year during the new-faculty orientation program? GB: VITAL, in co-sponsorship with the Office of Academic Affairs, welcomed 33 faculty colleagues at the new faculty program held August 18 and 19. While many colleagues are new to Villanova, some are (also) new to their full-time instructional roles. With over 40 presenters from across Villanova on hand, faculty were offered context for their central role in helping to support, inform, and advance Villanova’s mission, vision, and future direction. Among the program topics addressed were professional development support, students’ expectations, academic support services, instructional policies and resources, and teaching in the inspiration of St. Augustine. Attendees represented 22 departments across colleges: Accountancy, Augustine and Culture Seminar Program, Biology, Civil and Environmental Engineering, Computing Sciences, Economics, Ethics, Finance, Geography and the Environment, History, Human Resource Development, Marketing and Business Law, Mathematics and Statistics, Naval Science, Nursing, Political Science, Psychology, Romance Languages and Literatures, Sociology, Theatre, and Theology and Religious Studies. RD: What are the highlights of the new faculty program? GB: Given the comprehensive program, it’s challenging to identify just a few highlights. Based on feedback, the sessions that provide faculty with personalized insights into their teaching and scholarly roles at Villanova seem to be most appreciated. Among these sessions were the sessions addressing our students, academic support services, and the roundtable discussions with Falvey Memorial Library’s departmental liaisons. A faculty panel discussion on the subject, “What I wished I had known in my first year at Villanova” elicited vital advice for our colleagues. Key examples included creating a folder of all teaching records–such as unsolicited student emails, peer observations, CATS reports, syllabi, assignments, and advising activities—as a repository of material for the annual and three-year review; the importance of being patient when adjusting to a new professional environment, new courses, and new colleagues; setting realistic goals; accepting that things will not always go as planned; and viewing mistakes as opportunities for learning and growth. RD: Do you have any insider tips or advice for “newbies” on campus? GB: Being a “newbie” myself last year, I would suggest taking the time to listen, engage in conversation with colleagues, staff, and students in your department. Don’t be reluctant to ask questions or ask for clarification of procedures and conventions that might differ from those at your former institution (that may be more difficult to do for some of us introverts). Yes, the Villanova website provides extensive, detailed information, yet how long will it take us to find the one kernel that we are looking for? I have discovered that reaching out to colleagues by phone not only expedites the process but helps me meet new colleagues, learn about their work and deepen my understanding and appreciation for the Villanova culture and context. Plus I have found it most enjoyable to talk with colleagues-such conversations add a human touch to our mainly digital work world. Try and venture out of your department, participate in campus events that interest you or resonate with your values and passion. Take advantage of the many cultural offerings, such as superb theater performances that are offered free to faculty and staff on Tuesdays, or participate in an exercise class. RD: Can you describe VITAL’s main role on campus? GB: VITAL provides and coordinates services and resources for faculty members from all disciplines who are interested in helping their students become more effective learners. We collaborate with departments and University offices to identify and support student learning needs and help advance instructional goals. We offer opportunities to meet and learn from nationally known experts and serve as a clearinghouse for higher education materials. RD: What services that VITAL offers do you believe are the most valuable to Villanova faculty (both new and continuing)? GB: We provide a range of services that are designed to support faculty at various stages in their careers. Among the services we offer are confidential instructional consultations with individuals, departments or other groups; confidential classroom observations with constructive feedback; tailored sessions to meet departmental needs; mini-grants to support innovative teaching, learning, e-Learning and assessment of student learning; topical workshop sessions and campus-wide events that provide opportunities to engage with colleagues across the University. RD: Anything else you would like to mention to new and continuing faculty? We wish all of our faculty colleagues—both new and continuing—a fulfilling and productive new academic year and look forward to supporting them. You will always find a free cup of coffee or tea at the VITAL office, 106 Vasey Hall.